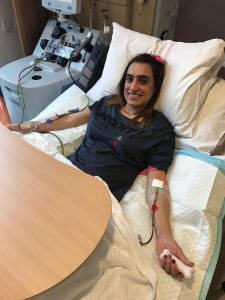 Fabulous news from Margot’s auntie Charlotte (one of Team Margot Foundation’s trustees) in Wolverhampton about her amazing friend Rajbinder Kullar – who is the only match in the world for a patient in need of a stem cell transplant – seen here donating her peripheral blood stem cells. You too can save a life. Please register as a potential stem cell donor here and then encourage ‘Just One More‘ to do the same.